In Yellowstone, particularly along the north side of their “Grand Loop” you can almost get tired of seeing all the waterfalls that this park has! It really is an amazing place to be. This photo I got when I was photographing the river that feeds into the Tower Falls. It’s a great waterfall to see and I highly recommend it. But when I was there, one of the main lookouts was damaged and in the midst of repairs. But the river that feeds into the water falls can be seen from the road. I explored the area just a little bit. I also took a long exposure of this same river from the bridge. I’ll probably share that in the future, too. But I wasn’t satisfied with that so I looked for a way to get closer to the river. Sure enough, there was a “little” rain wash gutter for rain water that hits the road to find its way into the river. I walked in (it wasn’t really that little if I could fit!) and set up my tripod at the last possible stable spot before I’d be taking a trip over the waterfall, too. But on the other side of the river, I could make out what looked like an opening that would be perfect for some hoofed animal to come up to and drink from the river. I took a bracket of photos and got on my way. There were some mosquitoes there that were too happy to have me around. I was pretty happy with this view. I cropped it down to focus on the other side of the river. I hope you enjoy. I redid my Chicago Skyline photo from the Planetarium! This was, in my opinion, a significant improvement on the first one I did for many reasons. Not the least of which was the feedback and new skills learned in The Arcanum. This photo was taken on a relatively cool evening and Lake Michigan was still shaking off the last vestiges of ice on March 20, 2014. The thin sheen of flexible and floating ice is primarily the reason why the reflection looks like this. This was also the weekend after Saint Patrick’s Day. That’s the reason why some of the lights are green. I wish I was posting more to the blog lately. I’ve been getting a lot more information about photography while in the Arcanum. It is certainly informing my artistic choices. I recently had a review with my Mentor (they call it a “Master”, but I think to those not part of The Arcanum, it’s better understood as a Mentor). I’ve basically learned that if I’m going to continue down this road of the ultra large panorama that I have to be committed to examining a lot more detail. I think this will give me a larger hurdle to jump than I previously thought. But it won’t keep me from trying! I’ve got a few more ideas to photograph. I got a couple in the works. There will be more to come. I know I keep saying that. But there will be. This particular photo was stitched from 4 (but mostly 3) landscape positioned frames of the City. They were all 10 second exposures. I rotate the camera about one third through the frame for better stitching. When I processed the photos, the first thing I did was cool the color temperature down a bit so that I can bring out all the different colors of the lights. Then I used Microsoft Image Composite Editor to stitch the frames but to also save as a layered PSD file. Before I saved it though, I changed the stitching method and made the horizon level. (The original had a curved horizon!) I brought it into Photoshop and from there I did my final edits. Please click on the photo to view it in Smugmug in super high resolution! This photo was made to be printed large on a 3×1 print. I recently changed printers with Smugmug to Bay Photo to accommodate this. Today’s photo was from my first morning in Yellowstone this year. I was on my way to Fairy Falls which is about a 2.7 mile hike from the parking lot that is not far from the Grand Prismatic Spring. If you’ve never gone for a hike at 5 AM, I highly recommend it in the summer. You get to see the pre-sunrise all the way through. There are so many colors in the sky! But today’s photo wasn’t of the sky, but the reflection of the sky in the hot springs feeding the Firehole River in Yellowstone National Park. The park’s fire history is also reflected here and some of the actual fire history is laying down in the river, too. By the way, the logs did have a blue cast on them. This was in part because of the dark settings, but also because of the mold that grows on them. Here’s the other news, I was recently enrolled into The Arcanum. This is a photography and arts education establishment run by Trey Ratcliff (and of course several others!). I’m actually surprised to be included. It’s run as an apprentice/master style of education. I’ll be learning along 19 other apprentices in my cohort. I am learning so much from The Arcanum. It’s only been little more than a week and I feel that my approach to photography and the art of image making has been changed for the better. I don’t think I’ll have much to report on this learning process until I’ve gone through my first major critique. I am seriously honored to be included with this group. The photographers in my cohort have all been doing this craft far longer than I have. While I’m sure that my ‘master’ will impart a fair bit of knowledge, I’m sure I’ll learn just as much from my co-apprentices. The education style is in many ways like taking a masters level classes at a university. But then, my Bachelors degree is a Bachelor of Arts (History). So, maybe it’s different in the sciences in upper education? I hope you’ll get to see some significant improvement in my photography in the coming months! Today is a black and white version of what normally people see in many shades of red. My eye isn’t as struck by those colors as it is by the patterns in the rock. So I converted this to black and white and really amped up the luminous difference in the colors that were there. I think I’ll post the color version tomorrow. With landscape photos, you sometimes have to deal with what you are dealt with. On this day, it started with fog and lots of clouds. As the day wore on, the clouds were slowly breaking up and you had a trickle of moments like this where the Tetons said, “Hello!” before hiding behind another cloud. But when they come out and say hi it is amazing and a treat! Like many of my photos, I was prepared to process this in HDR, but a single still did the trick image. Not too much processing. Just enhancing what was already there. If you click on the photo, you’ll go to my fullperspectivephotos.smugmug.com page where you can view up to the full size of the photo. This was at Arches National Park on July 1, 2014. I was pretty thrilled to be there. This was the last day of my vacation that also took me to Yellowstone National Park and the Grand Tetons National Park. Side note: I would have visited this park last year if someone hadn’t thrown a lit cigar but with it’s wooden cigar ring at my car window as I was entering the Grand Canyon National Park last year. That cracked my windshield. I still saw the sunrise at the Grand Canyon, but after that I traveled as fast as I reasonably could to Grand Junction, CO to get the windshield replaced. There is another arch that is part of this general formation called the South Window Arch. But this one was a little easier to set up at. It’s amazing how when the sun rises, so does the wind! The wind just funnels through these arches, picking up all sorts of sand and what not! It made changing lenses impossible. But it was also making life difficult for my tripod. It’s a heavy and sturdy tripod, too. I wish I had more time for this park, but maybe I’ll get to it again in the future? 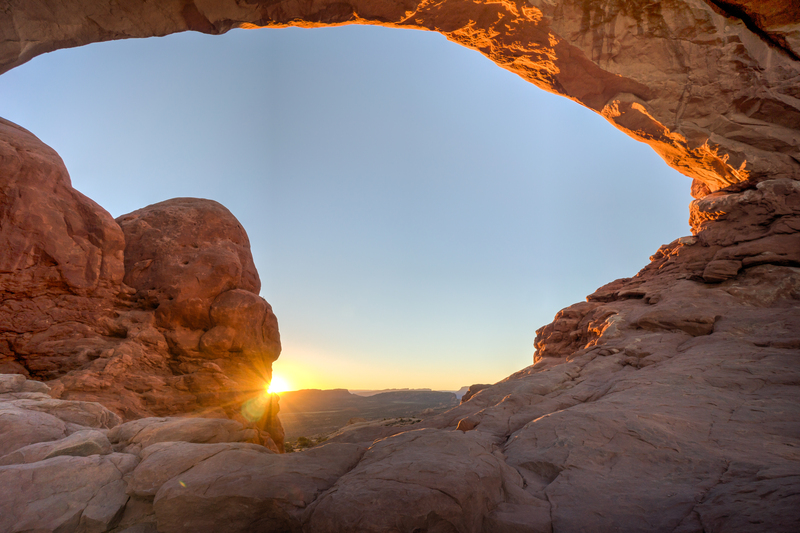 North Window Arch in Arches National Park at sunrise on July 1, 2014. I am back, Happy 4th! My Yellowstone trip. I am back from visiting the 3 national parks. I went to Yellowstone, Grand Tetons, and Arches National Parks. So, for the next several days I’ll be posting photos from there. Anyways, today’s photo is from Yellowstone. One of the ideas I was wrestling with was the idea of how do you know that the photo is from Yellowstone, or any other place for that matter? I need to add context to the photo. Often time, that context is something in the foreground. When I saw this bison and the mountains and sky, I knew I had that element. There were actually two bison here, but I decided to wait for the other one to wander out of the frame. He was a little too active and making the image unbalanced. To process the image, I did HDR processing. A little layering, to make the bison more defined. A little playing with the saturations, sharpening, and so on. At the Chicago Botanic Garden, they have the Regenstein Center and in one part of it is an indoor atrium. They really know what they’re doing. This atrium has a skylight, it’s long and has pools of water at either end. This arrangement of color and texture was really fun to look at. I set this as a panorama with my 50mm lens. The full resolution image is nearly 10000 pixels wide! If you click on the image the link will bring you to my smugmug page where you can see the full resolution image. The Chicago Botanic Garden’s Regenstein Center’s indoor flower garden. I like Dahlias. They express their colors so dynamically. Pinks, reds, magentas, to a blazing yellow and orange fire deep inside the flower. A Dahlia in bloom and another waiting it’s turn to open up. I have to admit that I had to post this one because I saw Anna Ryndak (a Google+ Photographer) post her picture of one of the Chicago Botanic Garden’s Dahlia’s and I just had to show mine, too. This one was from a few days ago. What happens when I have a tripod and take my time! On this fourth day at the +Chicago Botanic Garden in a row, I had an initial feeling of boredome. NOT THAT! KISS OF DEATH! I dreaded my results. I needed an idea, inspiration, a LIGHTBULB! Lucky for me the lights came on at the garden again! I knew that the green house would need the lights and this time, I had the tripod because I didn’t need to carry an umbrella. Tropical Green House at the Chicago Botanic Garden. After the lights come on the green house shows a different character. Who do I invite? Since I have a short attention span and I just liked +Wendy Baker ‘s awesome photo of Yellowstone’s Grand Prismatic Spring… well, I pick YOU +Wendy Baker . The rules are simple, post photos for 5 days in a row. Tag me in each post, tag 1 new person to do it each day, and use the hashtag #fivedayquest . You don’t have to start right away. Start whenever you want! The idea is that it’s daily life.